This post is about a low-profile terror attack today that has gotten almost no news coverage: also about little examined matters like where the terrorists come from, how they got there, who sent them and what this might mean for us and for peace and the future. They're serious existential questions. An Arab attempted a stabbing attack in the Hatmar Junction (also known as the Territorial Brigade junction - ed.) in Samaria on Monday afternoon, close to 3:00 pm. The stabber was eliminated by IDF soldiers at the scene before he was able to harm anyone. This is the same checkpoint where another terror attack was done just yesterday. 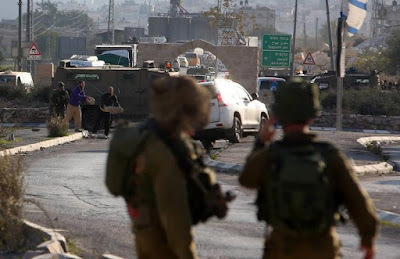 As Israel National News reported that, a little after 9 am Sunday a Palestinian Arab woman launched a stabbing assault on Israeli pedestrians in a place the article calls Brigade Square in the Samaria district. She failed to inflict any injuries on anyone. The attempt itself came to an end when a vehicle driven by a former head of the Samaria Regional Council deliberately plowed into her in order to thwart her obvious intentions, immediately after which IDF soldiers on duty at the site, acting on the relatively-new "shoot-to-kill-terror-attackers-in-the-act shot and killed her in the act. Today's attack is reported in the Arab media with a few more details. This version comes from International Middle East Media Center, self-described as "a joint Palestinian-International effort [that] combines Palestinian journalists' deep understanding of the context, history, and the socio-political environment with International journalists' skills in non-partisan reporting." It got started in 2003. Just how non-partisan is something we can discuss. Israeli forces shot and killed a Palestinian teenager on Monday afternoon after he allegedly attempted to stab an Israeli soldier at the Huwwara checkpoint south of Nablus, Israel's army said. An Israeli army spokesperson said that as the Palestinian approached the checkpoint, he "drew a knife and attempted to attack a soldier." She said that the soldier "responded to the immediate danger" and opened fire on the Palestinian, "resulting in his death." The Palestinian Ministry of Health identified the alleged attacker to Ma'an News Agency as Alaa Khalil Sabah Hashah, 16. If they're right, this makes the hapless attacker at Huwwara Checkpoint the third Palestinian Arab 16 year-old child (yes, child) to be killed in the same day, today, while carrying out an attack on Israelis with a knife in his hand. We posted about the other two here and here. Erekat's pompous declaration ("just practising their right to self-defence") perfectly channels the condescension of the Palestinian Arab political elite that for decades has provided the foundation for relentless Palestinian Arab failure and self-destruction. He is the Palestinian Authority's prodigious Senior Vice-President for Strategic Resignations [here's a partial list: "Erekat may resign after failing to secure future for Palestinians", Gulf News, November 4, 2015; "Abbas rejects resignation of Palestinian peace negotiator Erekat", Jerusalem Post, November 17, 2013; "PA's Erekat: I didn't resign", Ynet, October 31, 2013; "Despite Resignation, Longtime Peace Negotiator Erekat Carries On as Before", Forward, March 2011; "Saeb Erekat resigns as chief Palestinian negotiator", February 12, 2011, BBC; "Palestinians' Top Negotiator Quits", SKY News, May 16, 2003; "Palestinian cabinet resigns", BBC, September 11, 2002]. Erekat's public, bald-faced lies ["Erekat: Media’s Favorite Liar Resigns", Honest Reporting, February 14, 2011] are the stuff of legend. But not among Palestinian Arabs; in his home market, he incites, prods and urges as effectively as the worst of the PA insiders. There is no single step we can think of that would be more helpful towards the emergence of a genuine peace-focused political process on the Palestinian Arab side than Erekat's actual, authentic resignation and removal from the "peace-making" process. But beyond that, and setting aside the decades of corruption, venality, kleptocracy and child-abuse of the deceased Yasser Arafat, no one is entitled to a larger share of the credit for the perpetual downward spiral in the prospects for a better future (or any future) of Palestinian Arab children than their current president, Mahmoud Abbas. 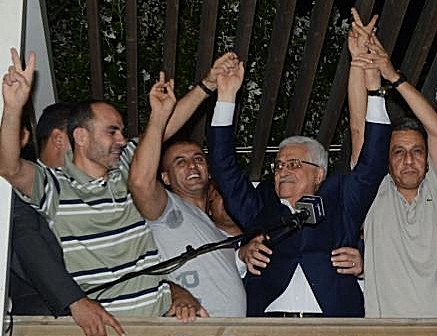 Elected to a four year presidential term 11 full years ago, the autocratic Abbas - frequently called "moderate" by journalists and public figures who don't know better - seems not to have missed an opportunity during all his extremely well-compensated years in power to elevate the standing of terrorists in Palestinian Arab society to the status of heroes and role-models. 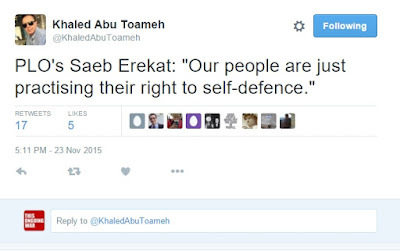 He has been at the forefront of Palestinian Arab society's one and only effective undertaking: the glorification of violence and terror. Today's three dead 16 year olds, all about the same age our murdered daughter Malki was when she was murdered by the people who groomed them too, join the long list of Palestinian Arab lives - many of them the lives of children - thrown away for nothing other than to serve the vanity, greed and weakness of this hateful, bigoted, kleptocatic octogenarian fraudster.